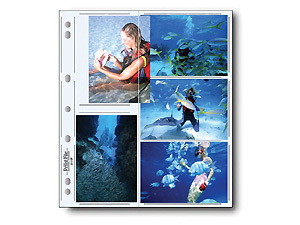 Clear 8 mil photo safe polypropylene page holds ten 3-1/2" x 5" prints. Requires wide 3-ring binder. Print File archival photo sleeves provide an ideal acid free storage solution. High clarity 8 mil polypropylene. Holds ten 3-1/2x5 prints. 25 pack. Print File archival photo sleeves provide an ideal acid free storage solution. High clarity 8 mil polypropylene. Holds ten 3-1/2x5 prints. 100 pack. Print File archival photo sleeves provide an ideal acid free storage solution. High clarity 8 mil polypropylene. Holds ten 3-1/2x5 prints. 500 pack.